For little boos and ghouls, we have lots of scary delicious sweets, like our organic, non-GMO, allergen-free Surf Sweets gummy candies. Or maybe you’d rather sink your teeth into some eerily irresistible handmade Lake Champlain Chocolate! Their spellbinding sweets will haunt all ages and crowds with an assortment of milk and dark chocolates, caramels, and truffles. 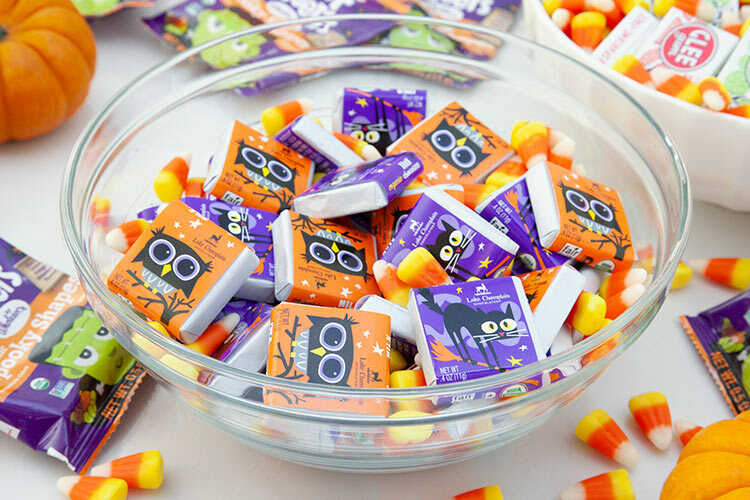 Hedge those vampire fangs with our bewitching boxes of sugar-free, Glee Gum in a variety of fruity flavors. This kid-friendly gum is wrapped in a hard-candy shell costume free of any artificial colors or flavors, wrapped and ready to delight those feisty Frankensteins craving a fruity lollipop. Create your own teetering tower of classic Halloween candies with YumEarth, another treasured brand of non-GMO, gluten-free, and certified organic treats like Jack O’ Lantern gummies, candy corn, and lollipops. These are a spooktacular addition to any bowl of Halloween goodies. And finally, dare to indulge at our baked goods counter with an array of petit fours: wickedly delicious mini-layer cakes in Halloween shapes and colors are filled, dipped, and dressed in handmade decorations. Need we mention that our green and black Union Market reusable shopping bags are perfect for parceling up all these scrumptious sweets? Happy trick-or-treating! NEXT Ready for Thanksgiving? We’re here to help!